By request of several of my faithful readers, I’ve put together a painting guide which showcases some of the painting techniques I use. 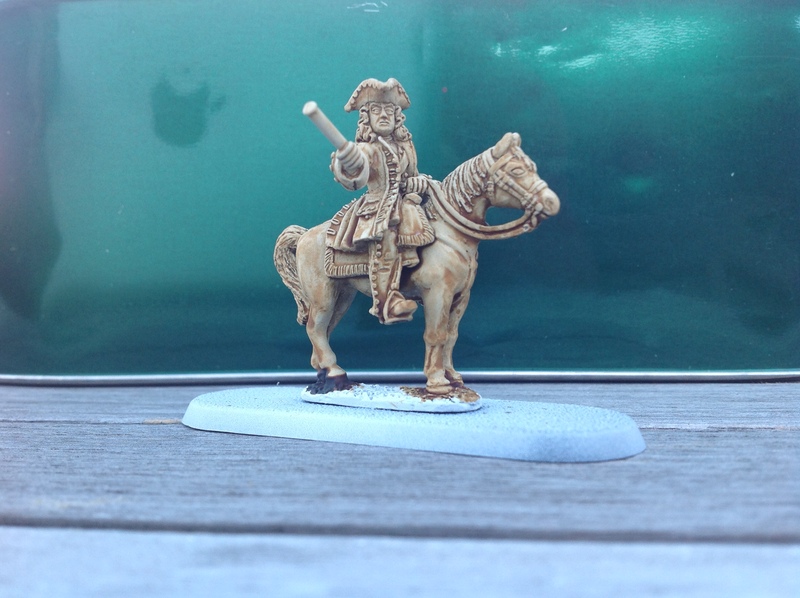 As I’m working on a commission involving several mounted generals for the War of the Spanish Succession, this is the subject I’ll be handling today. More painting guides will be offered in the future. Disclaimer: This model was photographed at various locations with differing lighting situations and with two different cameras, and as a result the pictures vary immensely in quality. Nevertheless, I hope they will do their job of illustrating my painting techniques. To start off: I’ve undercoated the model white, and then given it a wash of seraphim sepia. This immediately brings out all the detail on the model, which I find immeasurably useful for models with high degrees of detail; the various layers of clothing on this model, especially on the breast, are thus easy to identify. Next up we have the block or basecoat painting stage, where the major colours are all painted in. I’ve used mournfang brown on the horse and rhinox brown on the muzzle, mane, tail and socks. The skintone was painted bugman’s glow, and the tunic has been painted mephiston red and caledor sky. It’s not looking too well right now, but that’s about to change. Washes! 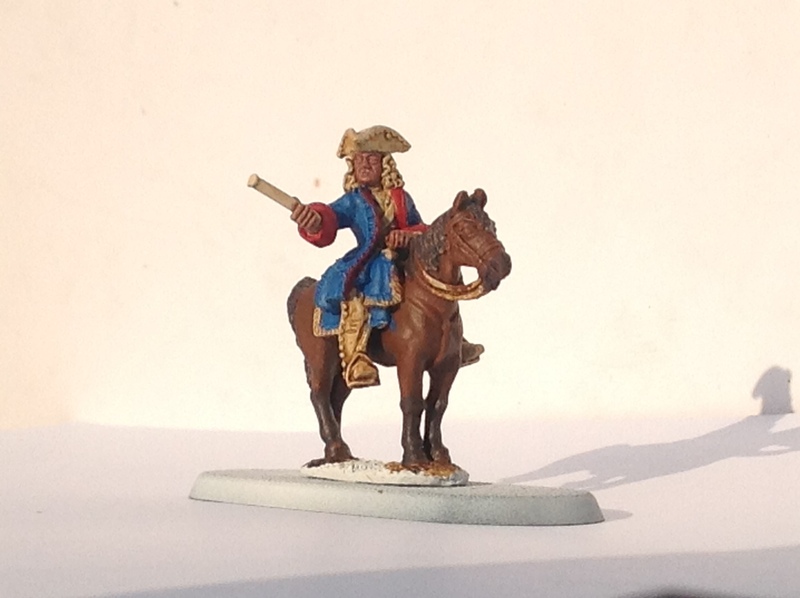 Most areas of the model have been shaded with a selection of washes. 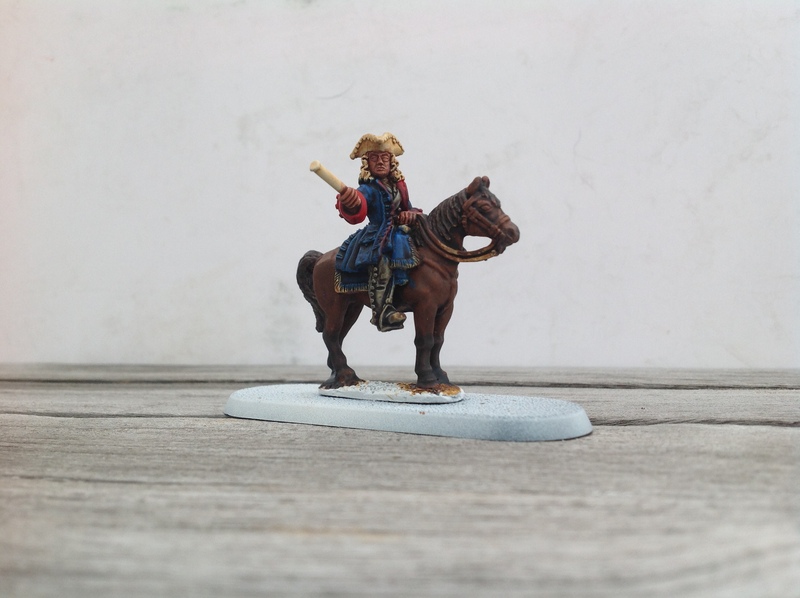 The skin has been washed with reikland fleshshade, the blue areas and trousers with drakenhof nightshade, and the horse with agrax earthshade for the light brown and nuln oil for the dark brown areas. Check out the combination of sepia and blue inks: a nice grey appears, which will soon be highlighted. Speaking of highlights: here we go! The horse has been worked up with first mournfang brown and then skrag brown. The leather areas were painted black then starkly highlighted with codex grey. As well as these finishing touches, the gold detailing was basecoated gehenna’s gold, and the telescope was basecoated hashut copper (unfortunately the latter wasn’t captured on camera). And the skin, of course: three successive highlighting steps of cadian fleshtone, kislev flesh and flayed one flesh. Already looking a lot better, isn’t it? At this stage, a major wash of druchii violet was applied to all blue, red and gold areas at once. I’m a major fan of purple washing, especially over gold, as it produces a very crisp shading result. 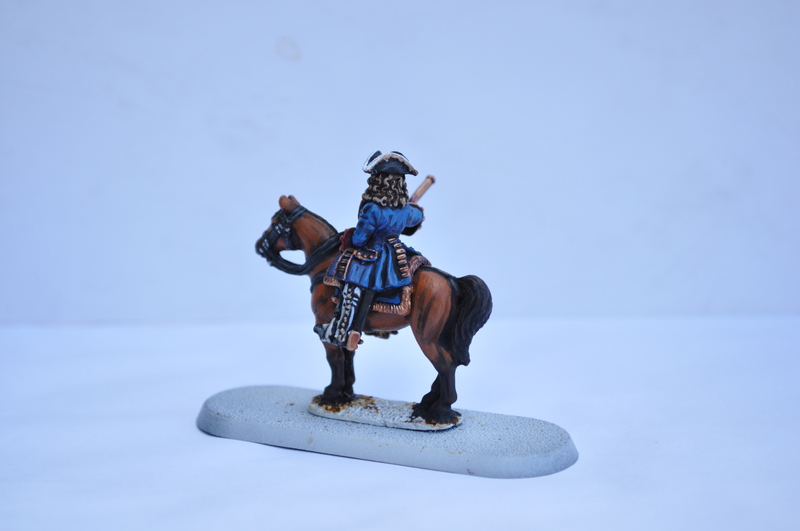 As well as this, a black wash was painted over all the leatherwork to reduce the starkness of those grey highlights. And then we’re on to the final highlights! The blue was highlighted again with caledor sky, the red with evil sunz scarlet (I still feel stupid typing that) and the gold with sycorax bronze. The white detailing was, of course, done with ceramite white. 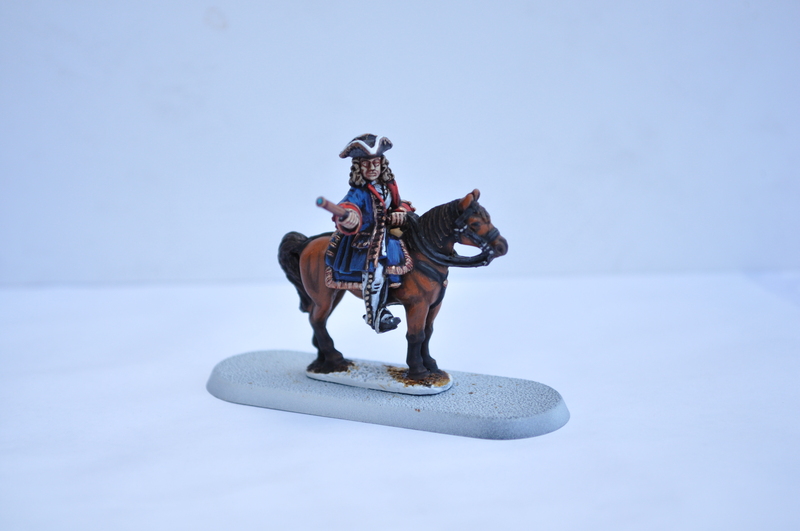 The back of this Front Rank miniature. The hair, by the way, is a simple coat of rakarth flesh followed by an agrax earthshade wash. Didn’t want to spend too much time on that anymore. 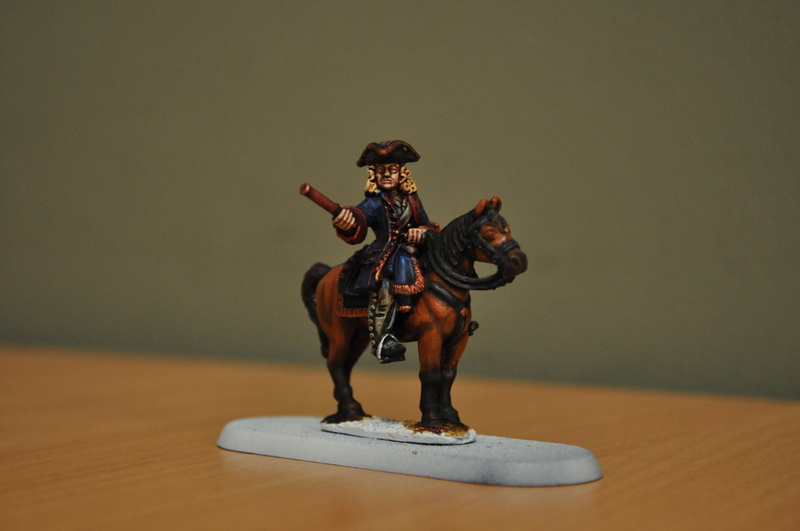 And there you go: that’s one painted French general for you. 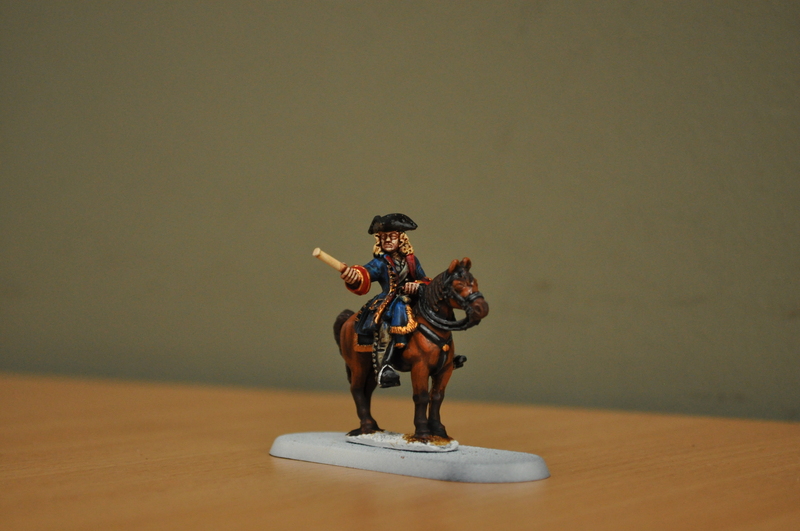 Interesting trivia: this model is actually the Duke of Marlborough by Front Rank Miniatures; the commissioner didn’t want him painted up as such but as a French, Austrian or Bavarian general. Naturally, I went and made him a Frenchman, because that’s how wicked I am! I hope you found this guide a bit helpful; if you have any other questions regarding this guide, do comment. And let me know which guides you would like to see me do in the future; there’s one I might do for my Dacians in the near future but I’m open for suggestions.